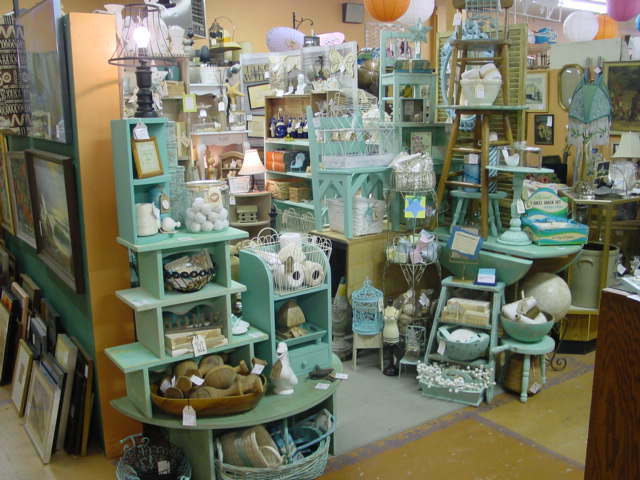 Stocked and spruced up and ready for the Summer Sidewalk SALE at STARS!! 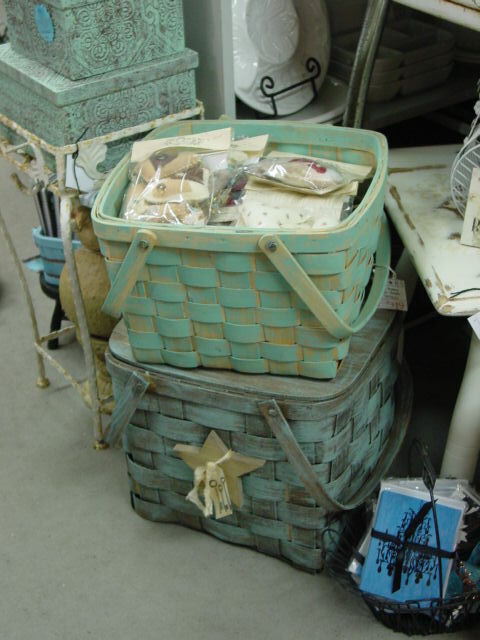 Stars BIG ‘Summer Sidewalk Sale’ starts Friday, August 31st and runs through Monday, September 3rd; Labor Day. This is really one of the BEST sales of the year at Stars. LOTS of vendors bring in ADDITIONAL inventory to set up on the sidewalk outside. Don’t miss this sale!! 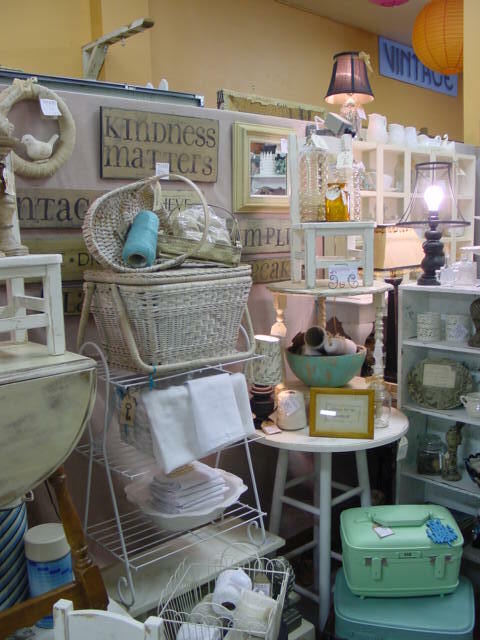 BOTH of my booths are stocked to the hilt; and as always, everything in my booths is 50% off during the sale. 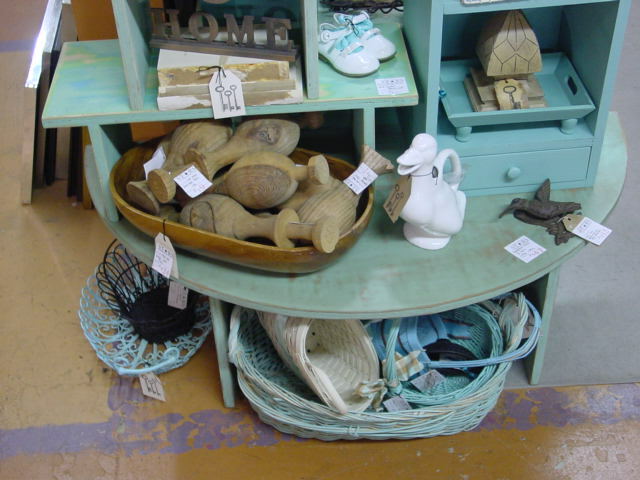 Last chance to purchase my beach decor items from my wall space. 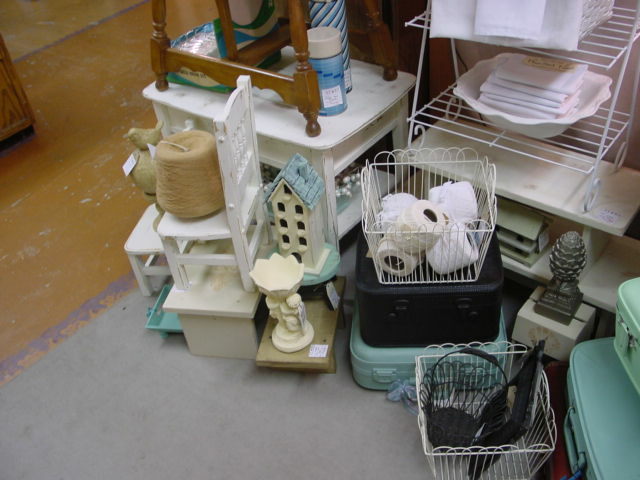 After the sale I will be converting the space to Fall decor. 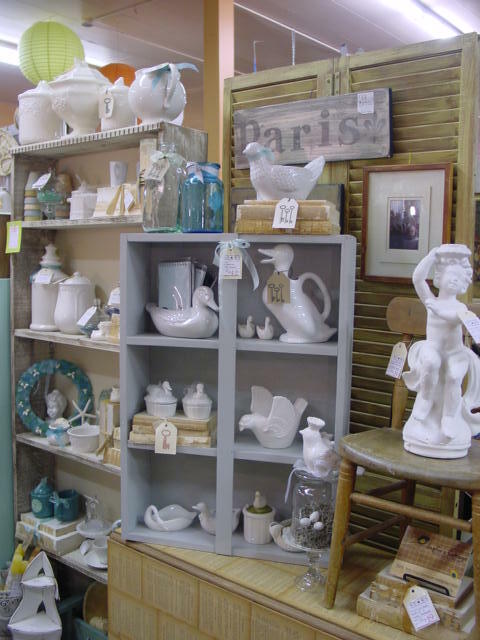 Lots of vintage hobnail milk glass vases and dishes added recently; as well as regular and gold rimmed milk glass. 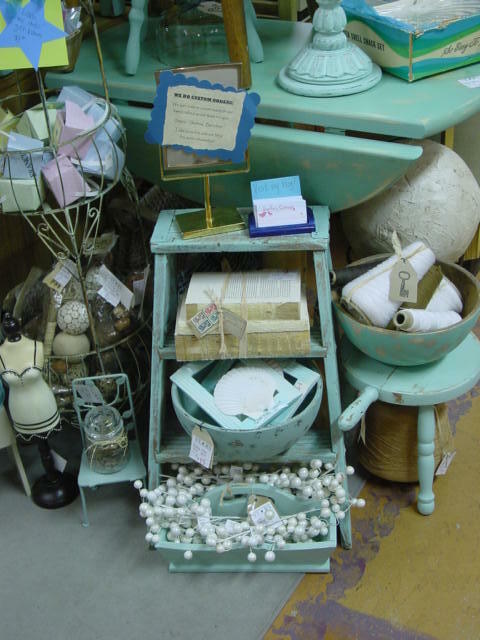 Vintage and upcycled beach decor. Big surag starfish, painted white and glittered. Little jars filled with tiny seashells or pretty beach glass. 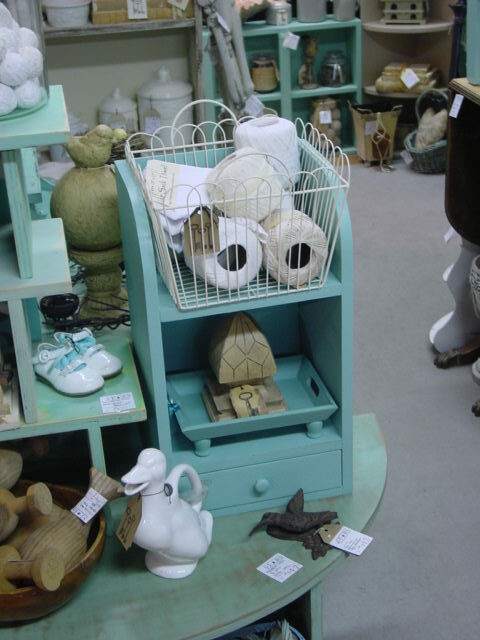 Shells mounted on wood posts and jars. 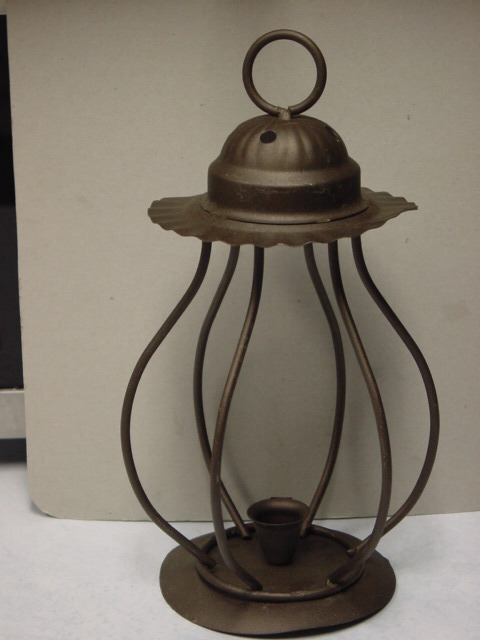 Candle lanterns and lamps. And of course, Mermaid crowns!! 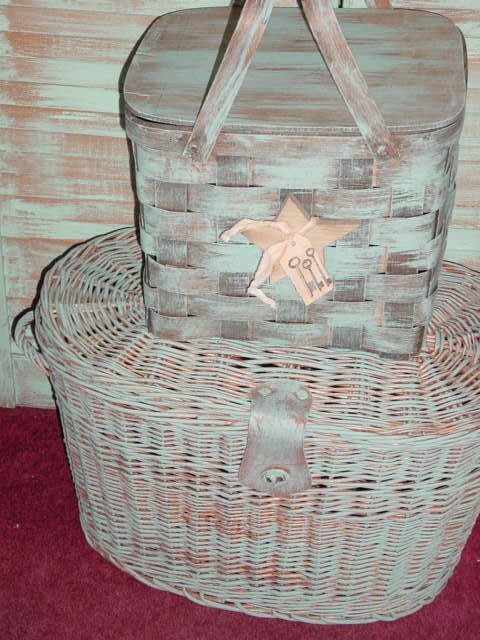 Vintage picnic baskets, bar stool, ‘breakfast in bed’ tray, wreaths, cubby shelves, trugs and wall decor. And that is just my little wall space! On to my 10’x10′ booth! No such thing as ‘too much’ when it comes to my booth!! 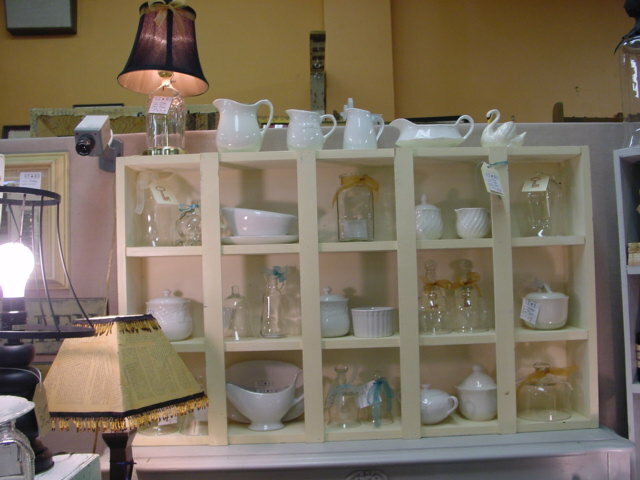 Vintage Fire King gold rimmed milk glass dishes and vintage Ironstone dishes are restocked and always plentiful. Both Stars Mall are open 7 days a week, 11am – 6pm. 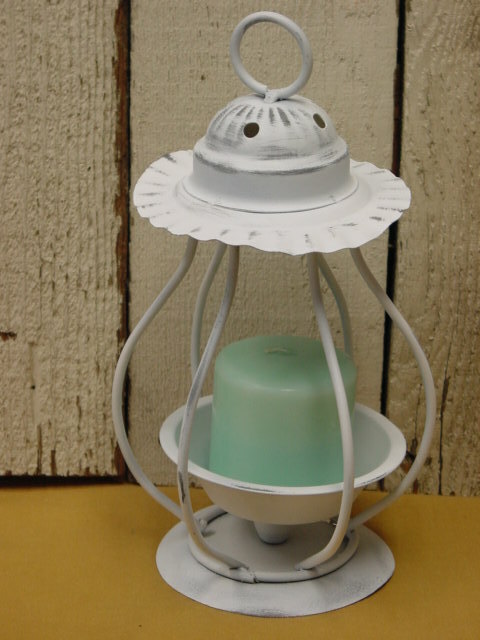 Thrifted rustic little candle lantern. The price was right so I brought it home for a make over. 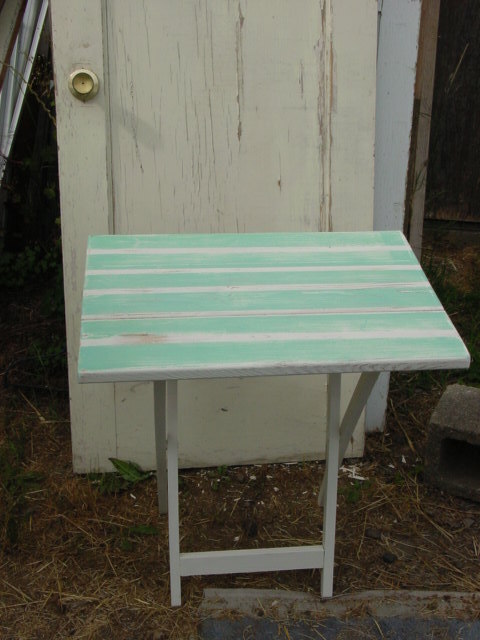 I spray painted it with flat white, and sanded a little to distress. Just to ring out the pretty details. 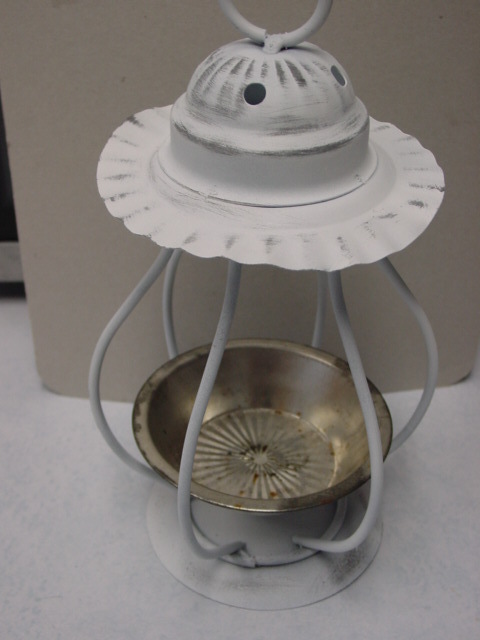 Then as it sat on my work table while I hunted for a suitable candle, which I could NOT find, I decided to alter it a bit more. 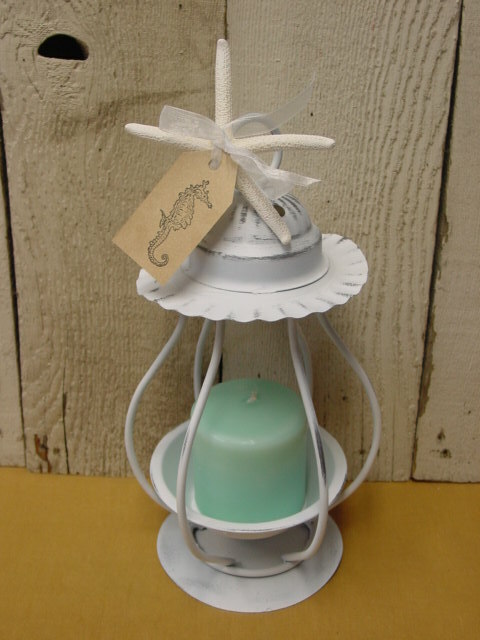 While I couldn’t find a small enough TAPER candle to fit the existing hole, I DID have several pretty aqua 3″ pillar candles on hand; which ‘filled the space’ much better anyhow! So I glued on (using e6000) a mini metal pie tin to put the pillar in! 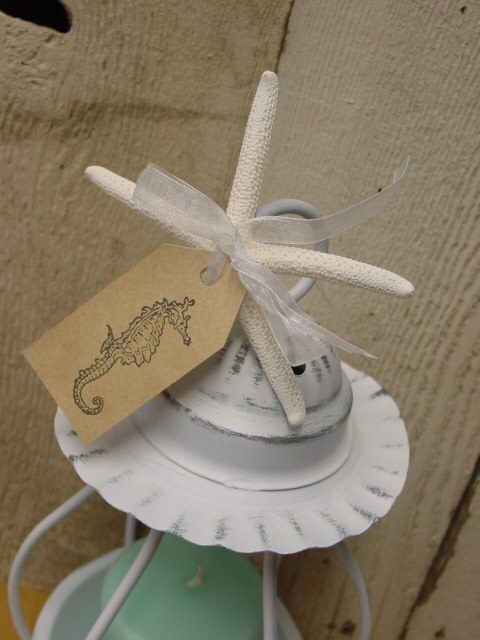 Then I ‘beached it up’ by tying on a white fingerling starfish and seahorse tag. Pretty AND functional (remove the tag before burning!) 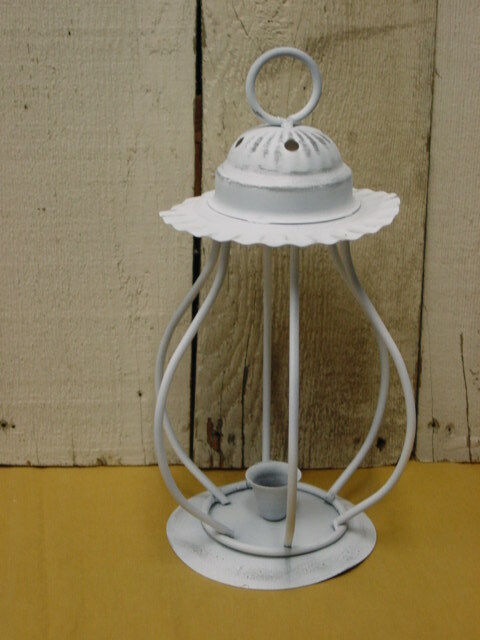 cozy beach cottage candle lantern. 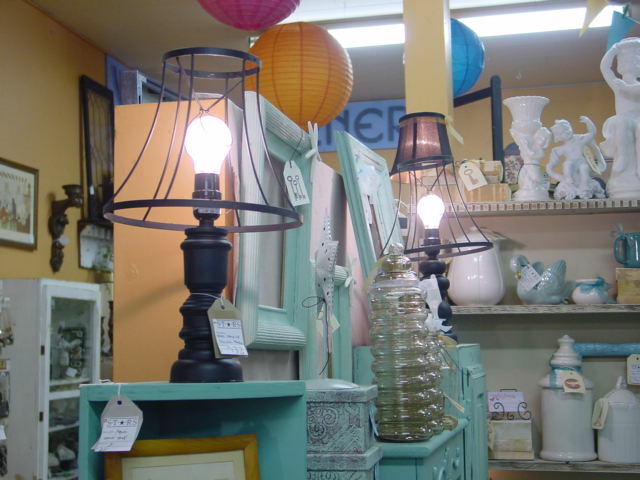 This lantern is for sale in my space at Stars antiques in Portland, Oregon. 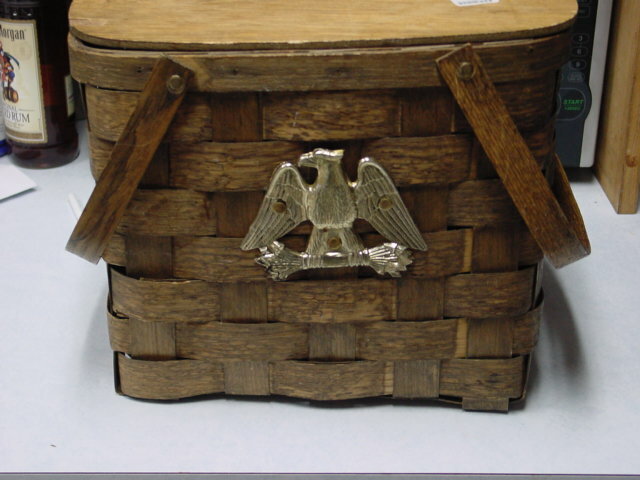 Thrifted wood slat picnic basket with cheesy PLASTIC eagle emblem, and solid wood top. Removing the eagle was harder than I thought. A bit of collateral damage to cover up some how. 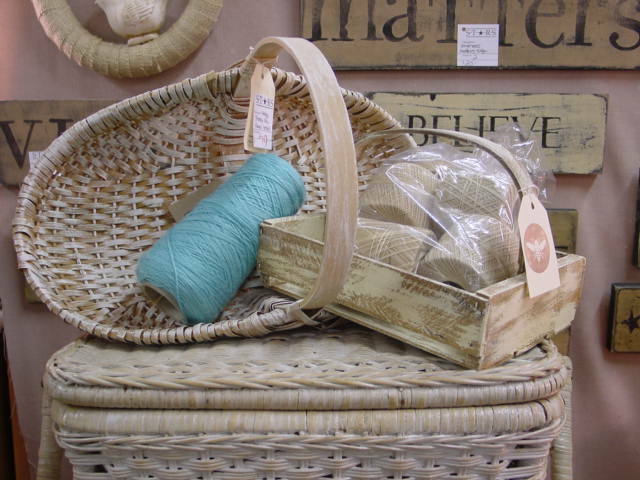 I ‘dry brush’ painted both baskets. LOVE dry brushing! Love how it looks AND how quick and easy it is to do! 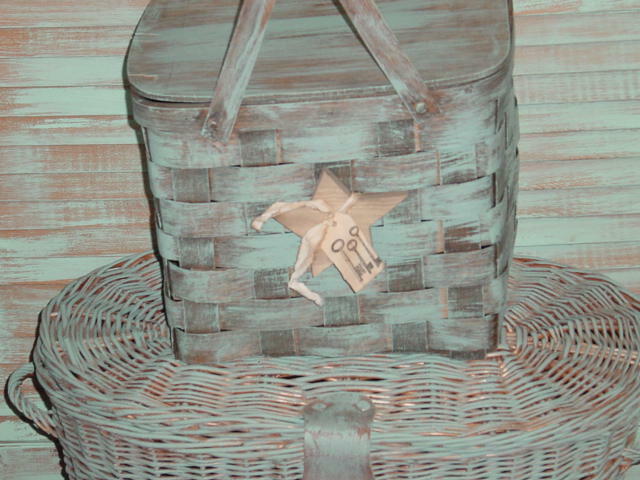 Took maybe a whole 15 minutes to paint each basket. My remedy for the damage from removing the eagle was to glue on a wood star and tie a strip of tea stained muslin around it. 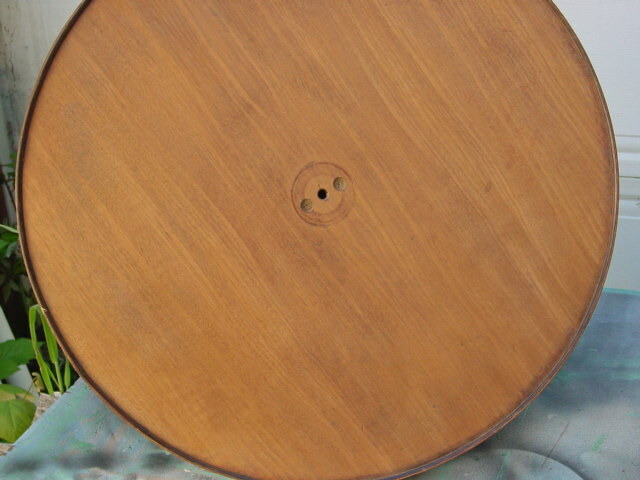 This oval one would actually make a nice little coffee table by adding a tray to the top. 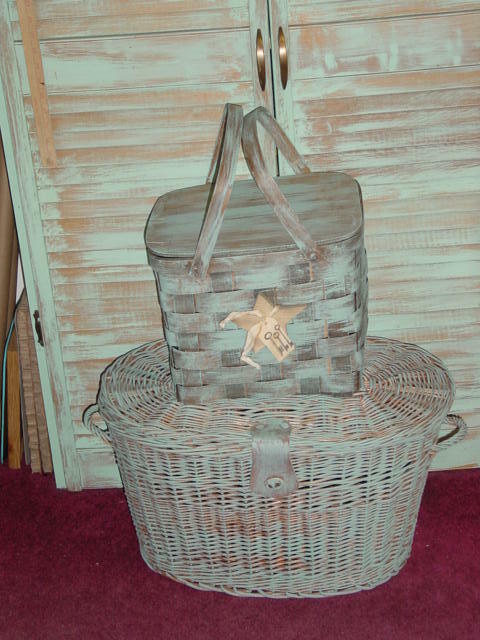 Another wood slat basket with an open top, that I’ve had for a while atop the lidded one I just painted. 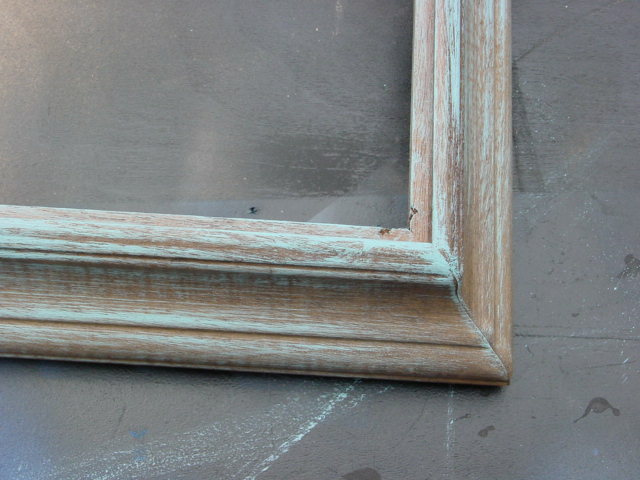 Inexpensive blank frame from rummage sale; thick frames work best for this project. No glass or backing needed. 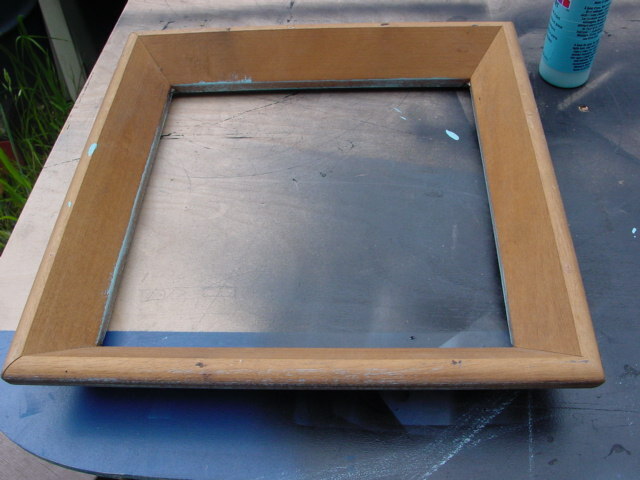 Painted the frame beachy blue, sanded for a bit of the brown to show though to shabby it up a bit; then glued on a white fingerling starfish using e6oo0. The satin bow can easily be removed. Just wanted to give it a try. Slightly better look at the distressing. (It NEVER shows up as well in photos!) I bought my starfish on-line. Can’t remember which website. Just browsed until I found the cheapest ones. 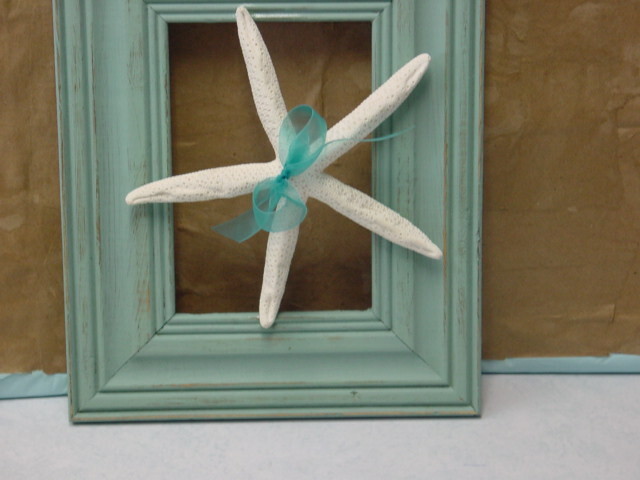 These fingerling starfish are a popular wedding item right now, so prices have really gone up! 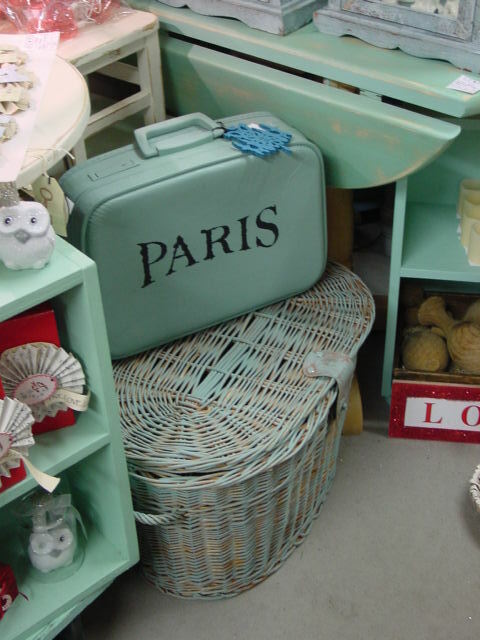 Your best prices will be from a site that does NOT mention they are for wedding supplies’. 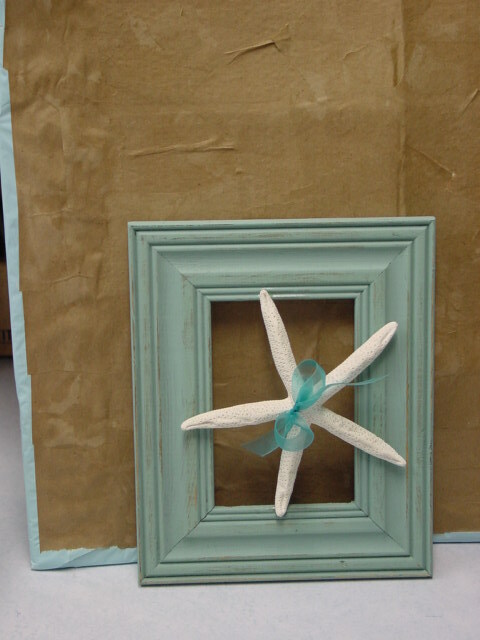 I also bought a few of the bigger ‘knobby’ starfish and used some big scallop shells I had on hand to frame similarly a while back. 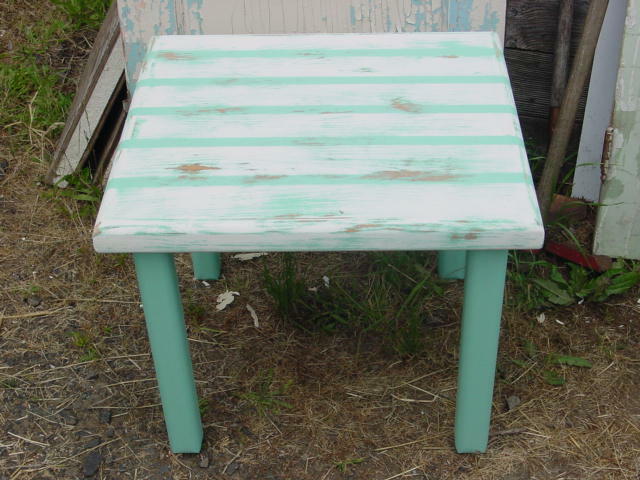 I’ve been wanting to try painting stripes on furniture for a while now. 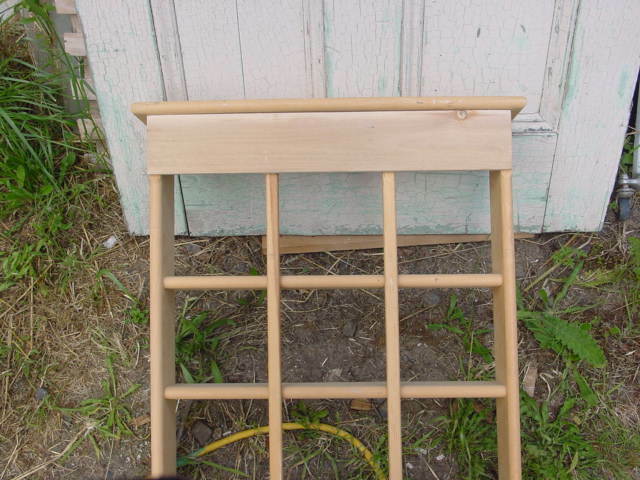 The top to this TV tray was beyond repair, so I had Michael build me a new, larger top out of some cedar boards. There wasn’t room in my booth at Stars to open it up; but here you can see that the new top IS much larger than a typical TV tray. Michael just had to move the ‘end stops’ out farther to accommodate the larger top. The thing that has ‘scared me’ about trying stripes thus far is getting them perfectly spaced. Seems like SOOOOOOOOOO much work! Measure. Mark. Tape. Measure. Mark. Tape again. With THIS project I already had two perfectly spaced lines since we used three pieces of wood. So from there I was just able to ‘eyeball’ my tape lines. Not bad for a first attempt, eh?!? 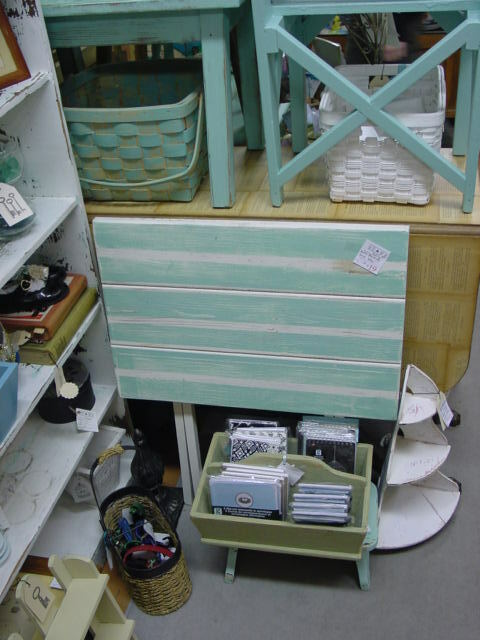 NOW I want to paint stripes on EVERYTHING!!! 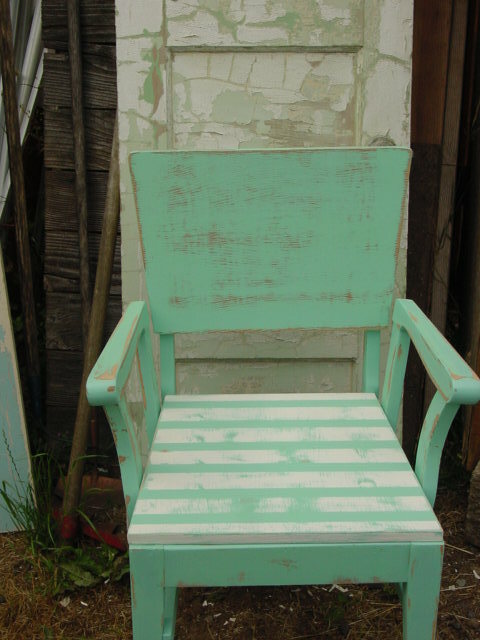 This chair was one of my very first make overs; back when it wasn’t really even a ‘thing’. 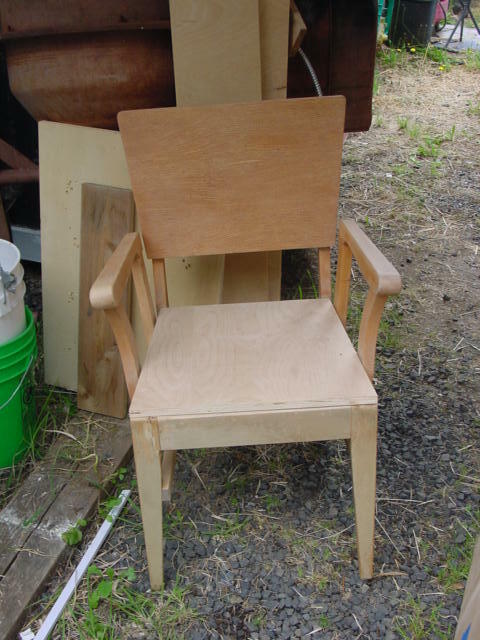 I found the chair in the dumpster corral at my apartment and dragged it home. Don’t have a before picture or even an after picture of its first re-do. I had covered the seat and made a skirt out of some pretty yellow and pink rose material. And it promptly became the cats favorite napping spot, underneath the skirt! I’ve re-dome quite a few chairs of late; getting NEW foam cushions and fabric. But they haven’t sold very well and I think it’s probably because of the price. But DANG! New foam for the seats is EXPENSIVE! Even at half price it’s spendy. So I decided for this re-do to NOT pad and cover the seat so I could price it lower and see if it sells better. 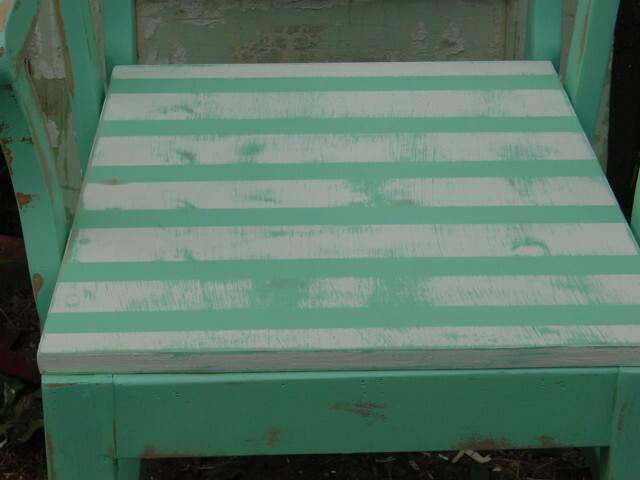 And I decided to paint stripes on the seat so it wasn’t so plain. Again, I just ‘eyeballed it’ when applying my painters tape for the stripes. I considered also striping the back, but that might be TOO much, so this is it for now. Do the stripes look too terribly not perfect to you? 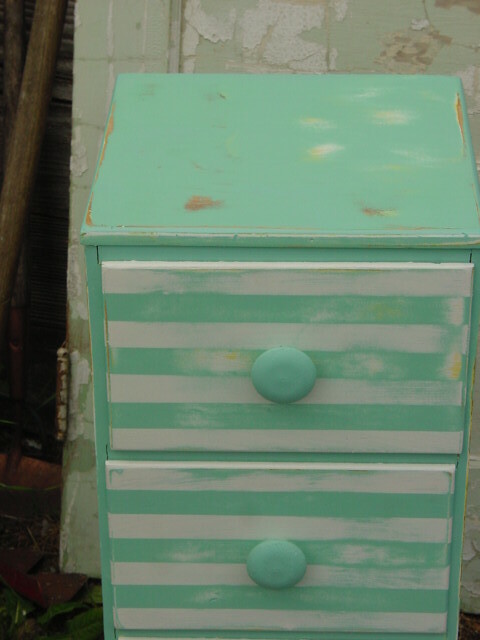 Victim number 2 of my painting stripes binge; a little 3 drawer chest from the thrift store. 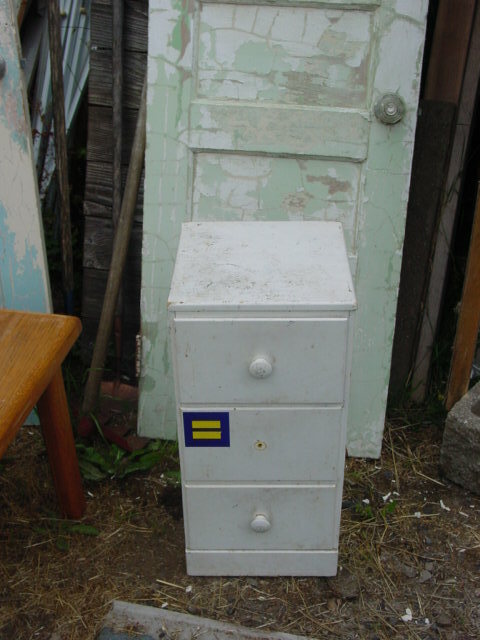 Little chests like this ALWAYS sell almost instantly; so it will be interesting to see if it goes as quickly with the stripes. 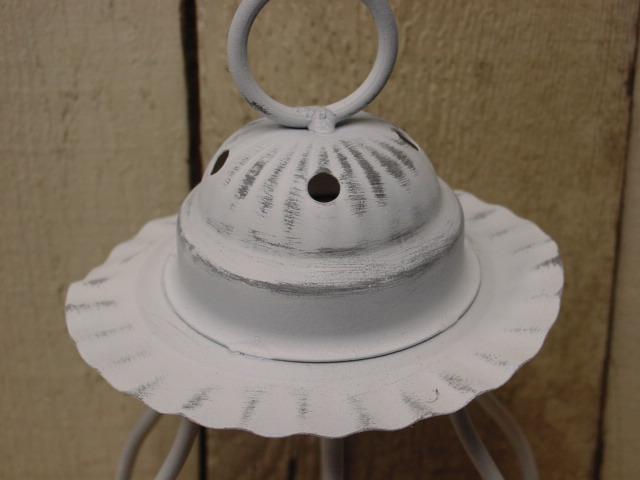 This baby required some SERIOUS sanding before I could paint it. See all that carving on the top?!?! 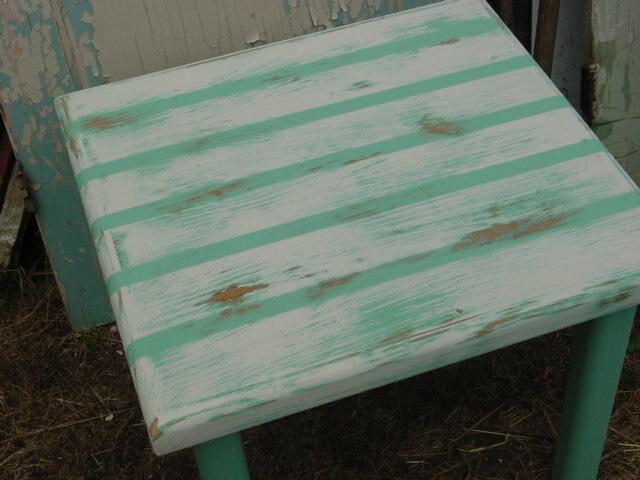 I painted the whole thing aqua, then added white stripes; then sanded to distress. You can even see a little bit of the yellow which was under the original white. 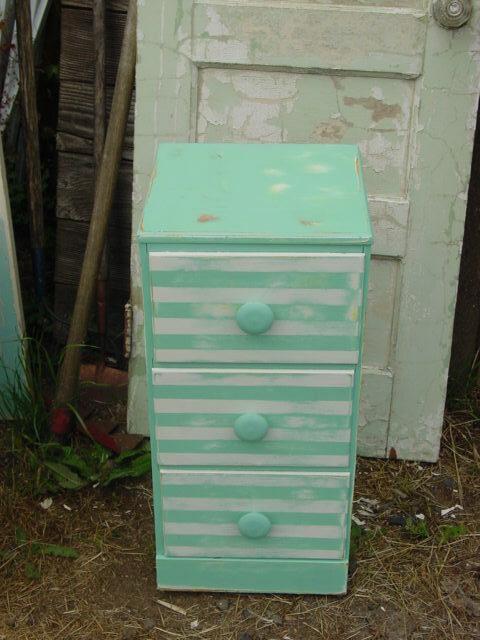 Again, with this one, I didn’t ‘measure’ my tape lines for the stripes. I started my first tape line across the center where the knob hole was, then added one more strip of tape above and below. Stripe victim #3 is a sturdy (Heavy!) 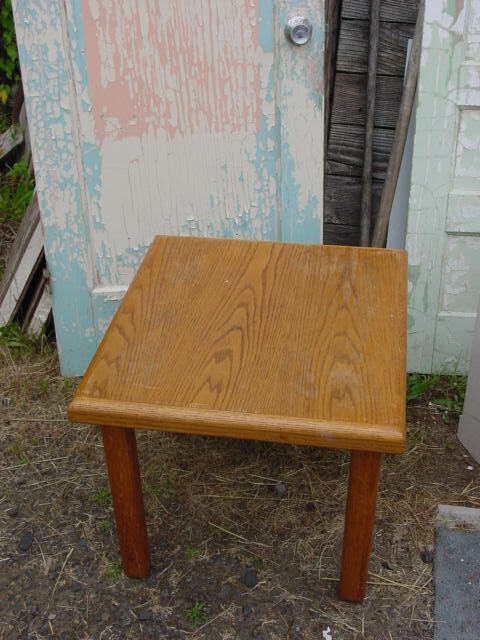 oak end table. 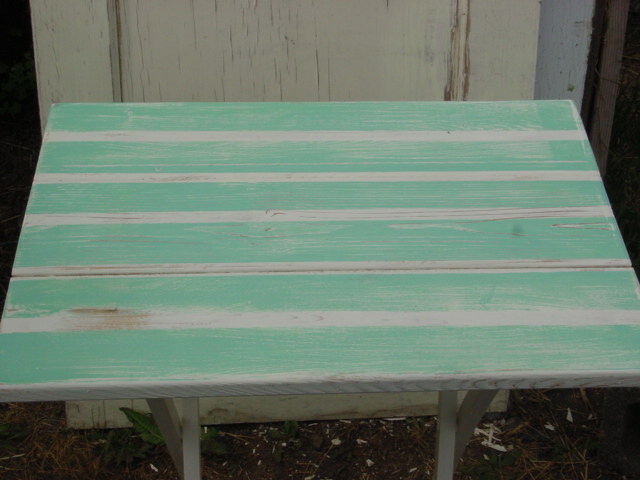 Gave it a good sanding, painted aqua, then the white stripes; then sanding to distress. On this one, I did measure to find my center for my first tape line; then eyeballed it from there. 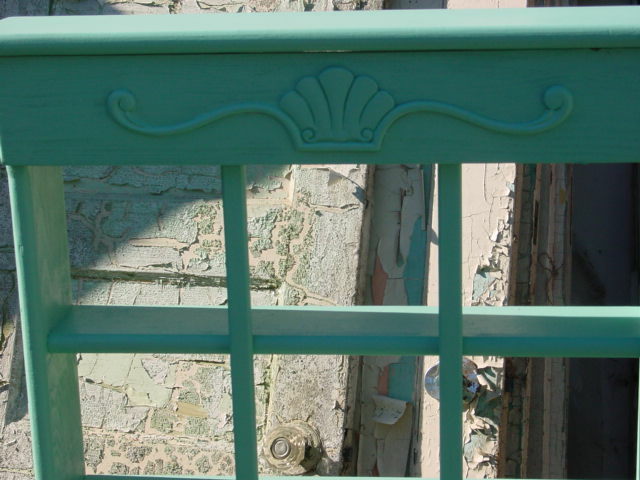 The distressing really hides any imperfections. I think I’ll call these my ‘Cabana Collection’. They will ALL be going to Stars as soon as I have room for more new stuff. 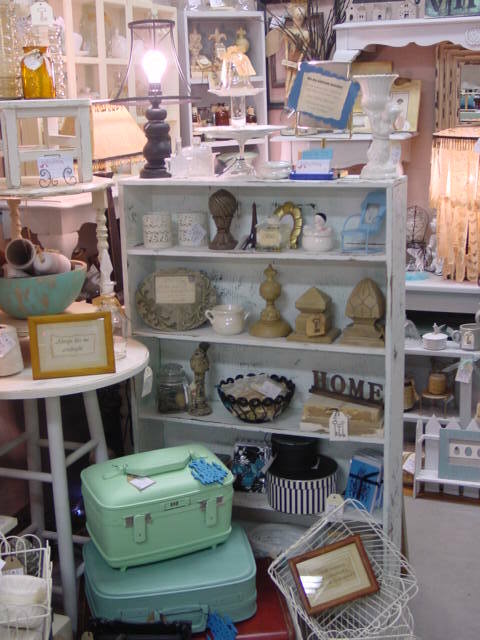 After a very busy sale weekend at Stars, I pulled the few remaining white pieces to make room for all my new beachy blue stuff. 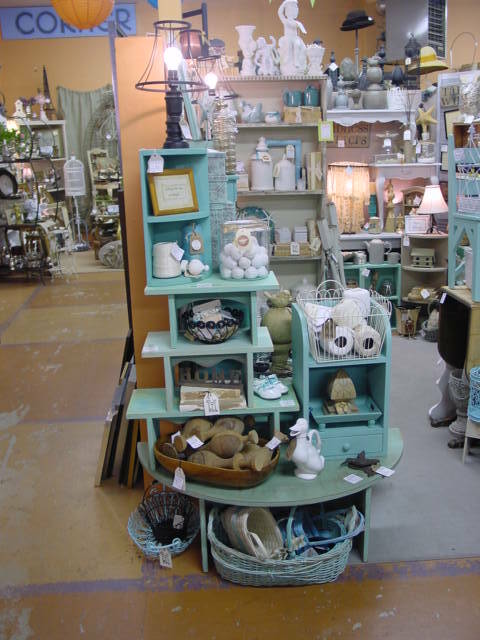 It’s a tight fit, but I did manage to fit quite a bit of the newly painted beachy blue stuff into the space by doing some serious stacking! 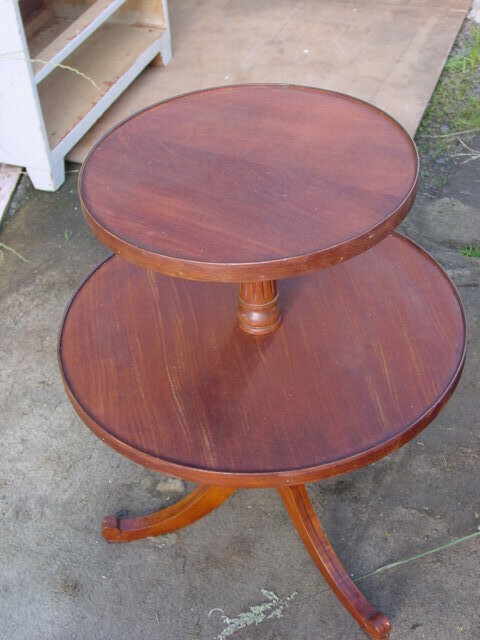 There’s the half round coffee table I recently showed you, on the bottom of the stack. 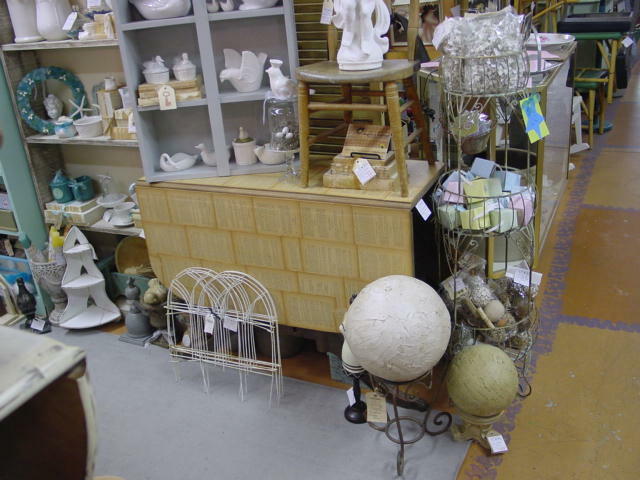 Topped with several benches, a little corner shelf and a small storage shelf with a drawer. 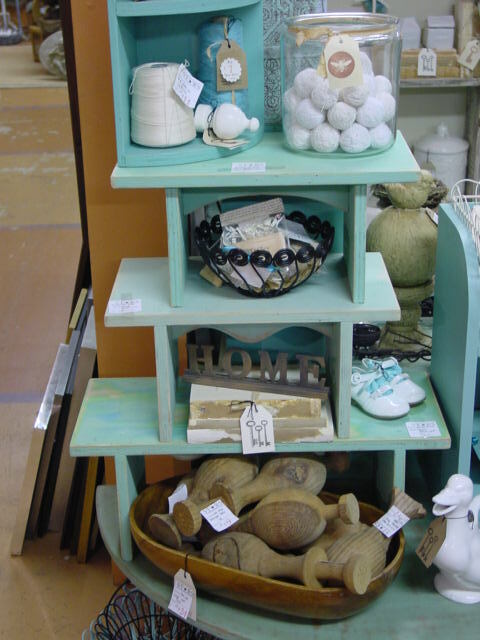 ALL of these items were constructed by us using reclaimed wood. Enough space under the coffee table for a basket of your favorite magazines. 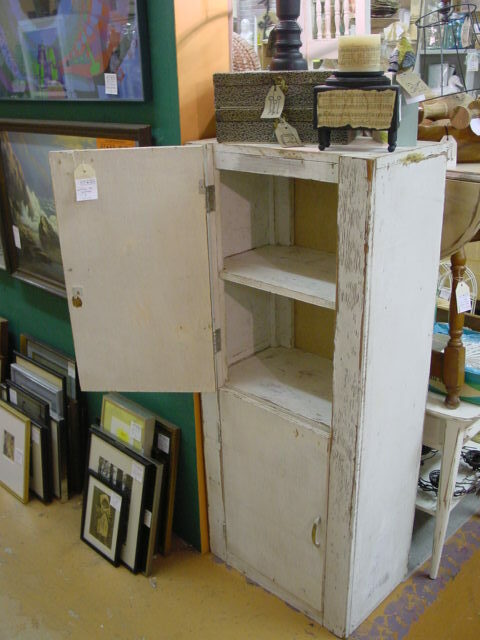 Little cabinet with drawer. 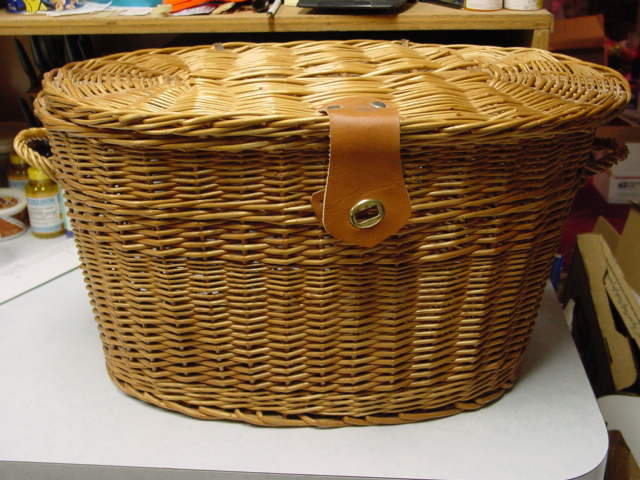 White wire basket sold separately. 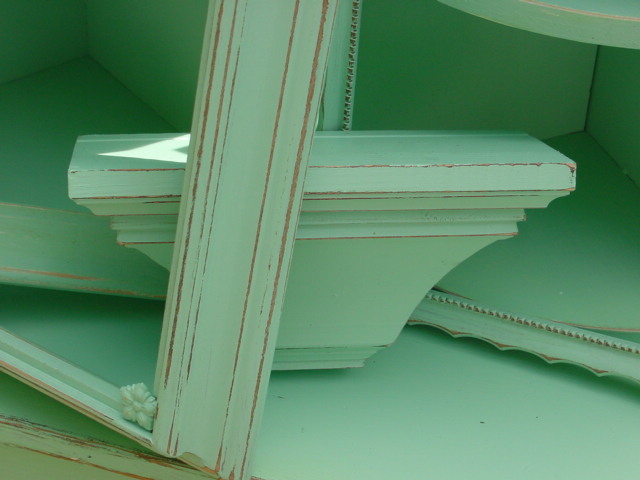 Assorted benches. 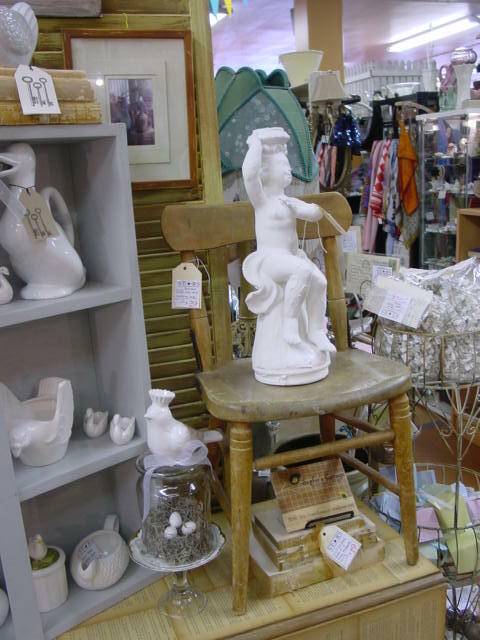 And a big vintage wood ‘trencher’ bowl filled with old architectural elements. 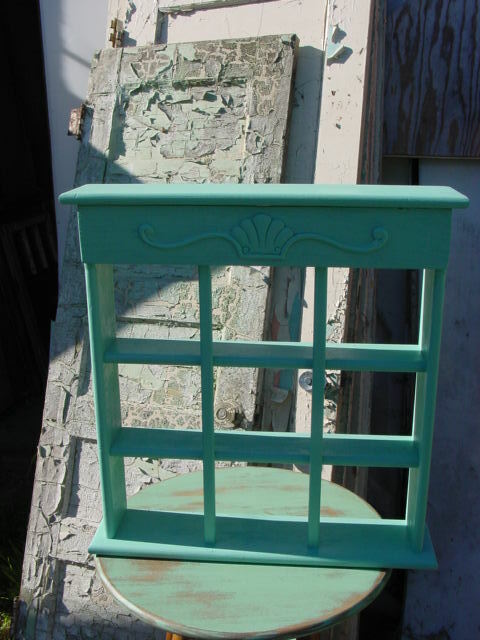 Little corner shelf for extra storage on the bathroom vanity perhaps? And little black lamps with ‘skeleton’ shades. Just LOVE these!!! 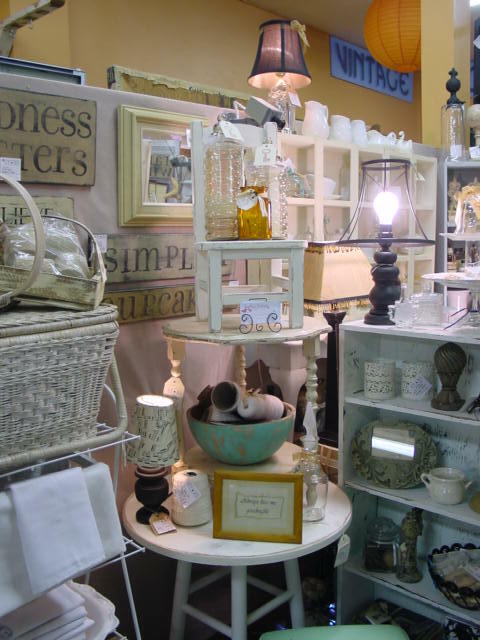 LOTS more stacked up on the right hand side of our booth! 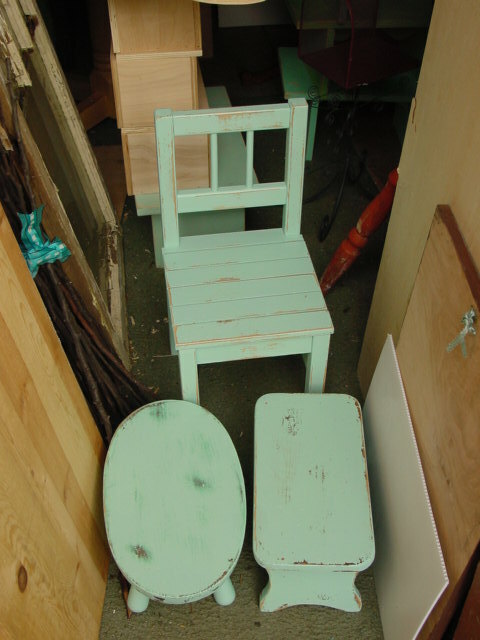 A gate leg and a drop leaf table topped with small tables and chairs. 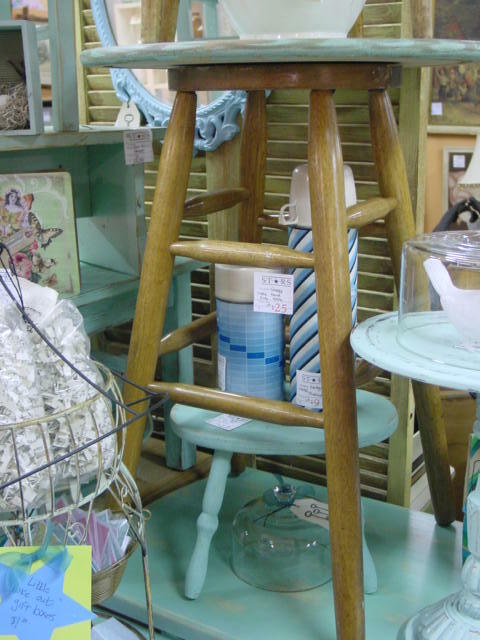 Vintage grubby little step ladder that I painted beachy blue, makes a great ‘catch all’ or plant stand. 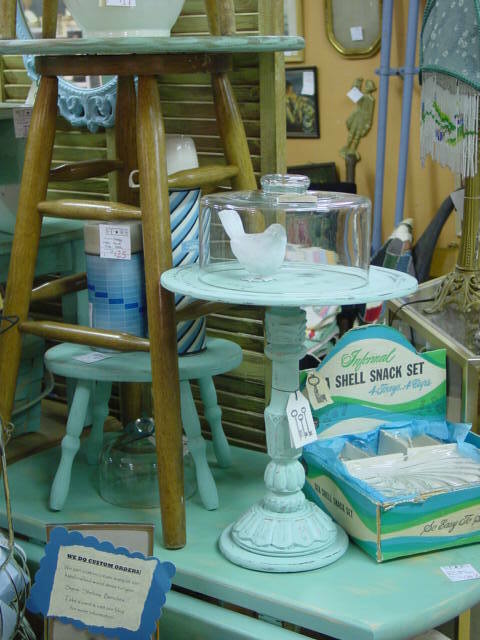 Atop the beachy blue drop leaf table, a small pedestal table with carved base, a medium sized occasional table with a little step stool underneath. 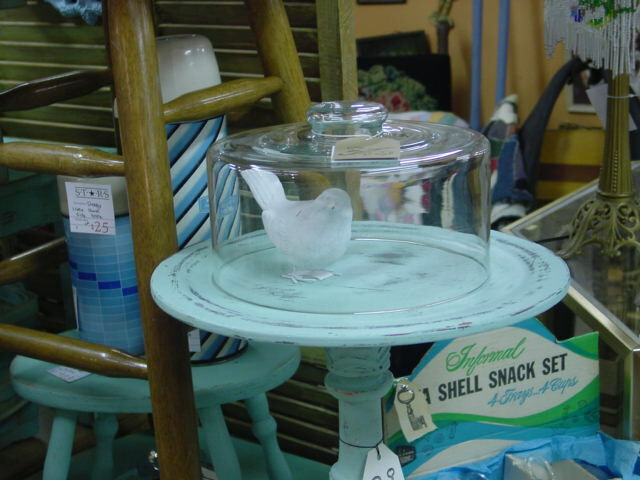 A vintage cake dome /cloche fits perfectly on the little table! 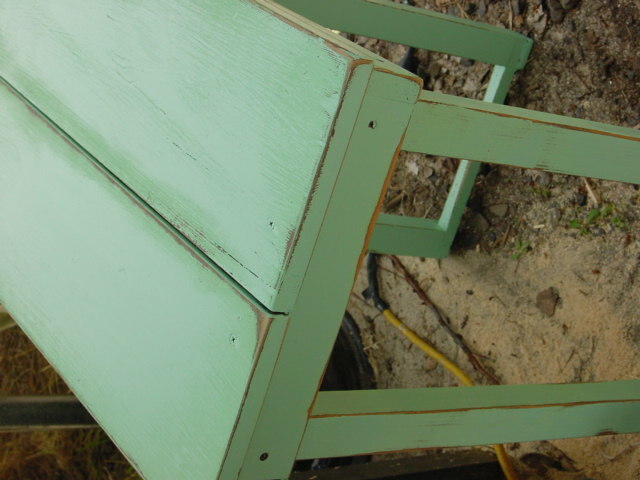 This is the repurposed bar stool table shown recently. 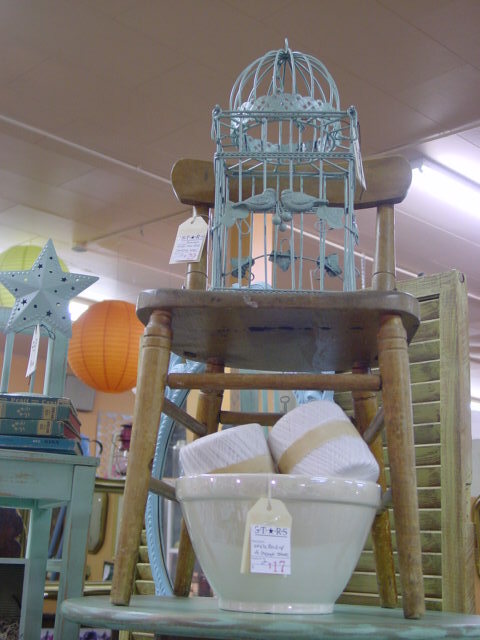 And a little vintage child’s chair with a bird cage on it on top of that! 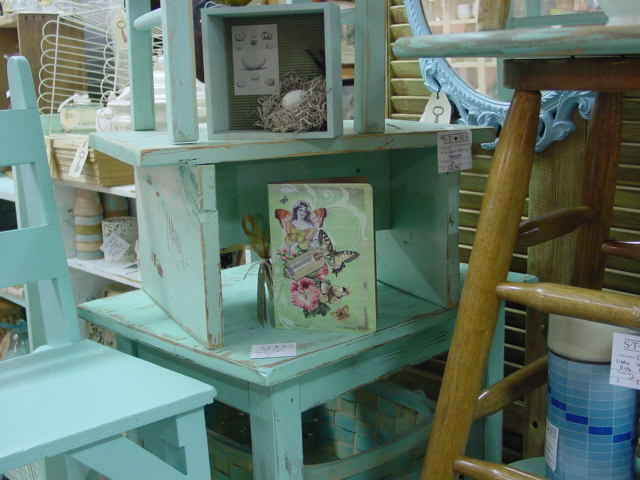 Behind the aqua drop leaf table is a gate leg table (covered with old book pages) and THIS stuff is stacked on top of the gate leg. 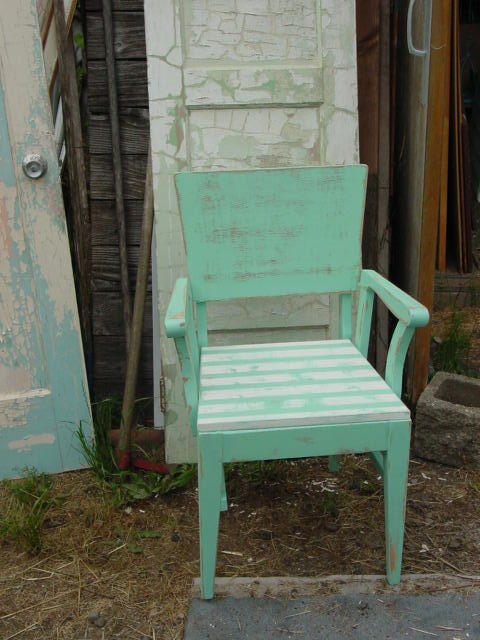 An aqua child’s chair and shabby little bench. 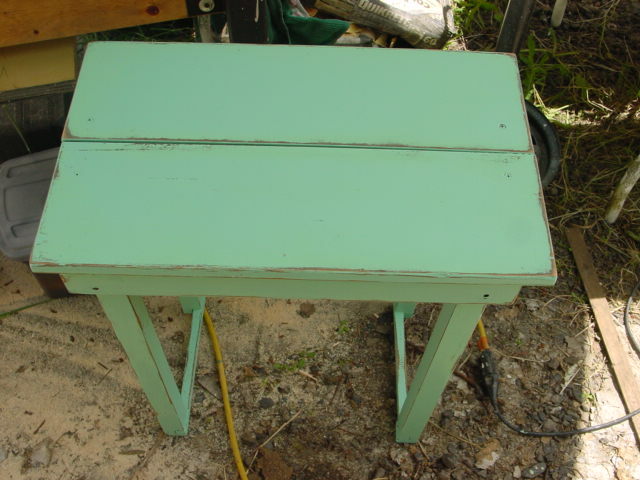 And an aqua end table under the bench. Kind of hard to get a good photo of some of this stuff because it IS so jam packed in there! A regular size chair next to the child size one. 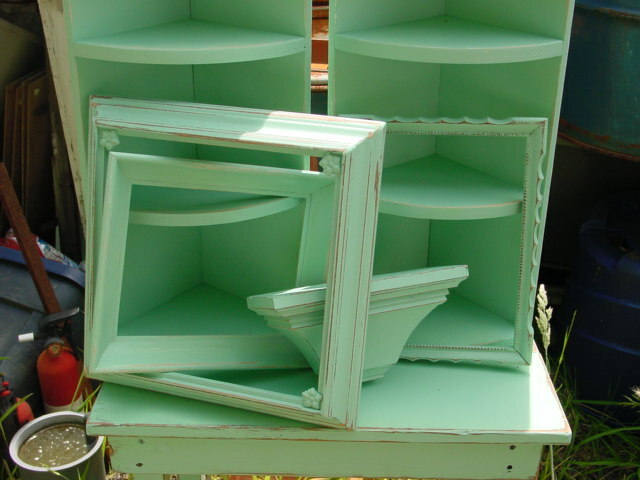 I come across old curio shelves like this quite often. This one is missing the ‘decorative top piece’ (you can see where it’s supposed to be); which most likely had one of those wonderful country heart cut outs in the center. Michael cut a new top piece and attached it for me. If this one HAD still had the heart cut out top piece still in place, we would have just attached this plain one right over the top of it to hide the heart. 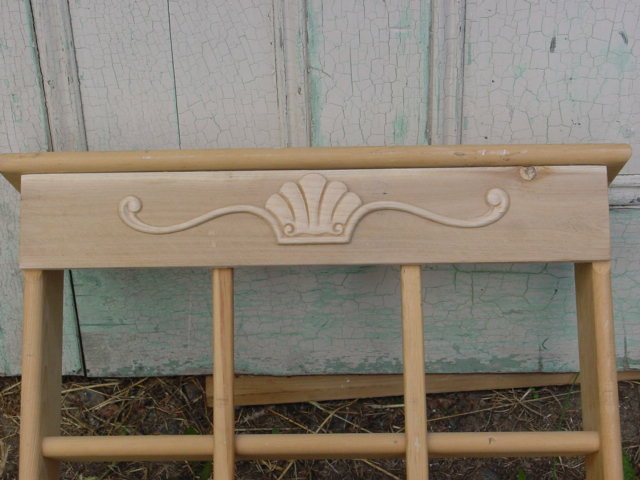 While the PLAIN top piece was just fine, and could have been left as it was; I decided to add a pretty wood applique. I’ve also added decorative stamp designs on that top piece in the past. Now it’s ready to paint! 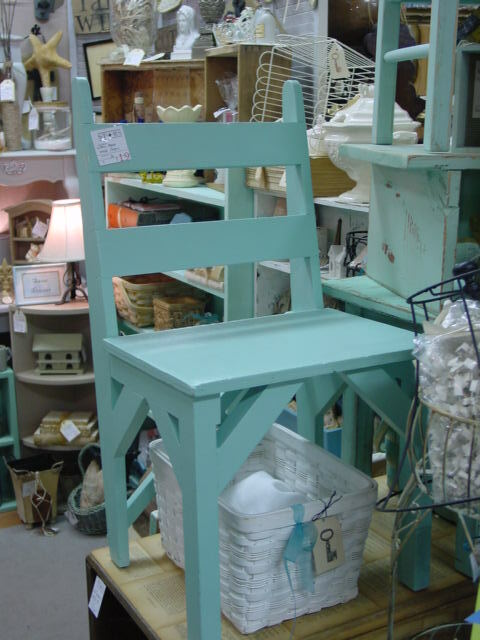 My signature ‘beachy blue’ paint was my choice for this piece. 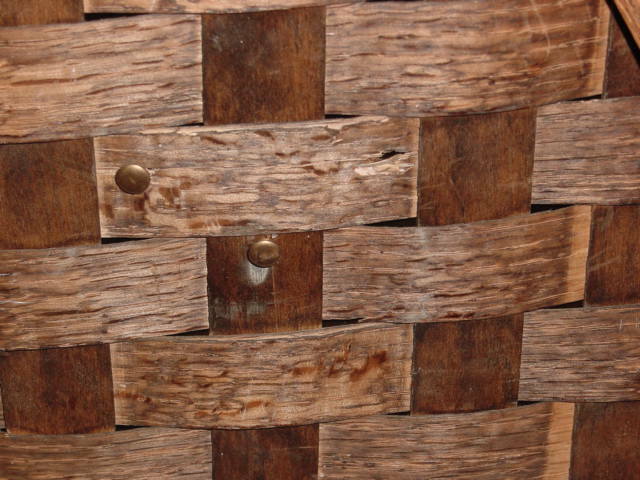 Close up of the wood applique. 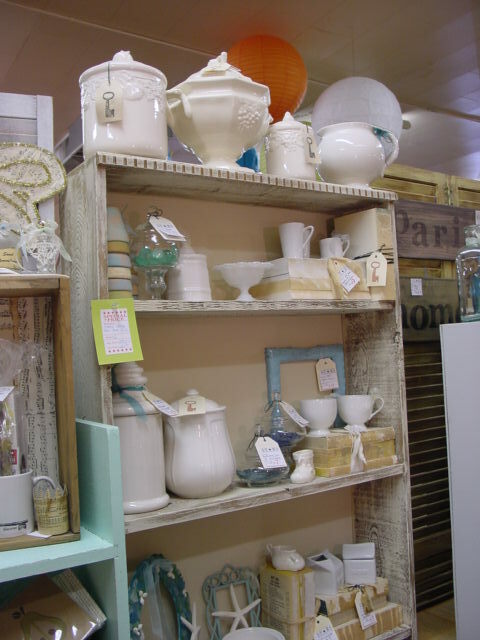 Won’t this shelf look great filled with a collection of little white cream pitchers?!? This, and the rest of the ‘beachy blue’ stuff I’ve been working on lately will be going to Stars by the end of this week. If you’ve been thinking about buying some of the WHITE stuff, get it NOW; because I’ll be pulling it to make room for the blue stuff. SALE @ STARS! 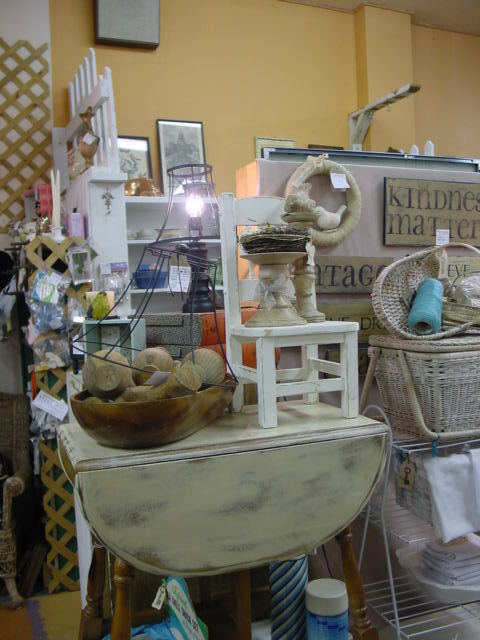 25% off everything in our space! FOUR DAYS! 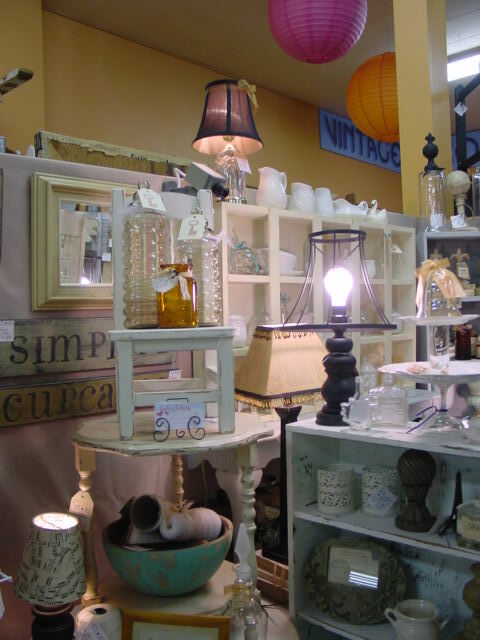 The big antique show is coming to the Expo Center this weekend and that ALWAYS means a SALE @ STARS! 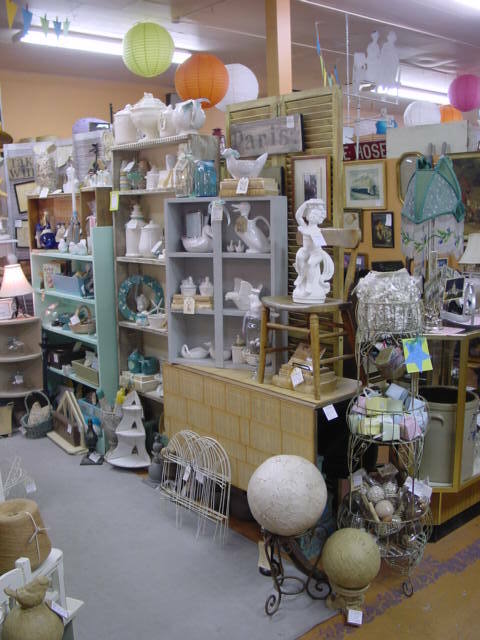 As with ALL sales at the antique mall, the sale % offered is up to each individual dealer, and WE always offer 25% off! The sale starts FRIDAY, July 8th and runs through Monday, July 11th. I was just in yesterday to restock, so the booth is JAM-PACKED with goods! 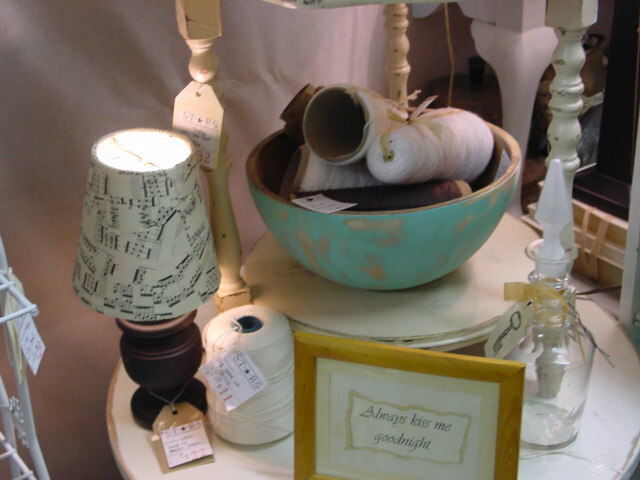 Just added this awesome gate leg table with old book pages papered top. During the sale it will only be $98.00!! And it’s VERY roomy when you open up both sides! Not sure exactly WHEN I’ll be re-doing the space and bringing the beachy blue stuff back in full force; but I’m getting ready! 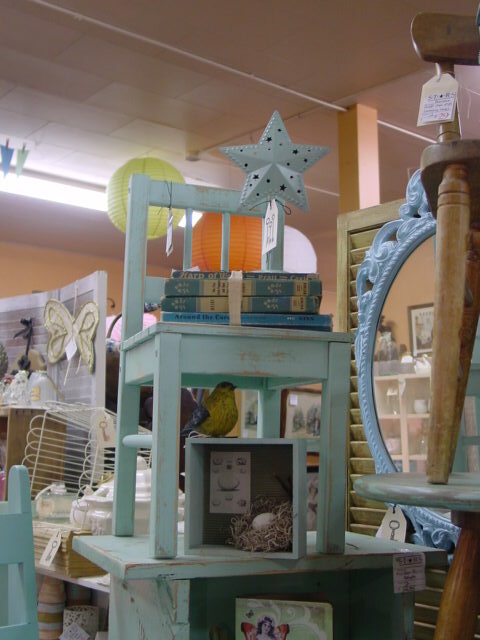 This wire bird cage and metal stars were spray painted. 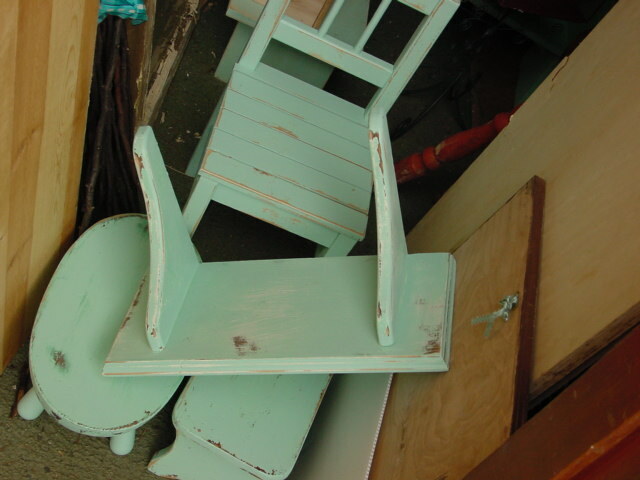 This vintage child’s chair and step stools were hand painted, then sanded to distress. 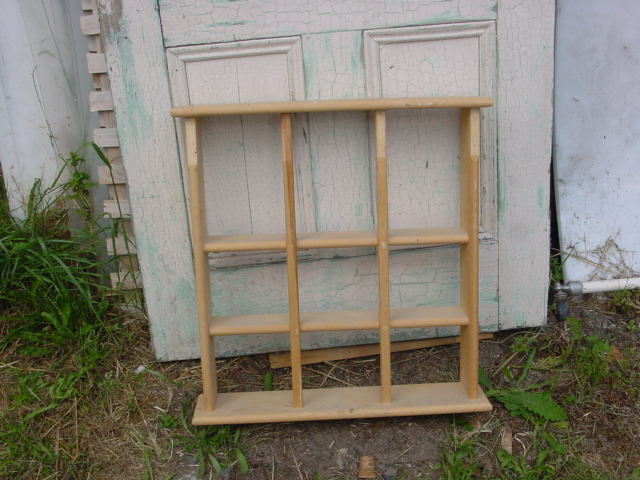 Likewise on this little wood wall shelf. I’m guestimating it will be late July / early August when I’m able to take the time to do a MAJOR booth re-do. Right now I’m focused on selling as much as possible at Camas before our scheduled move out date of July 9th. 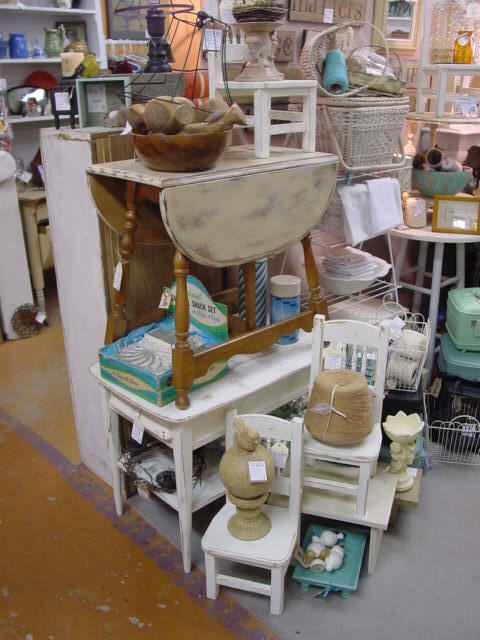 July 8th will be the LAST day to snag any half price goodies at Camas; as we’ll start moving out first thing in the morning on the 9th. 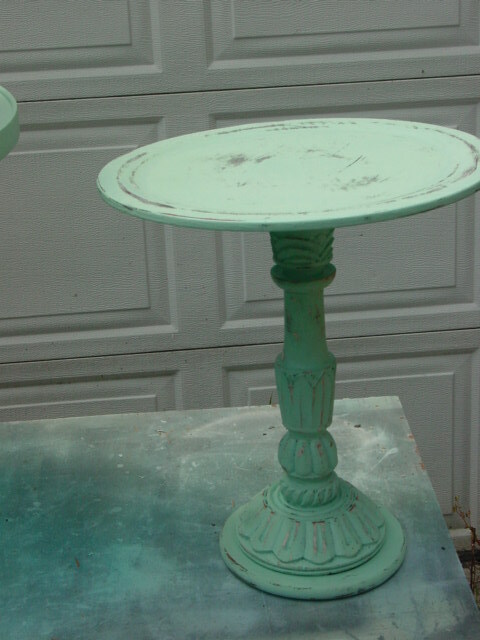 This little ‘smoking table’ was made using a big candle holder as the base and a round tray for the top. 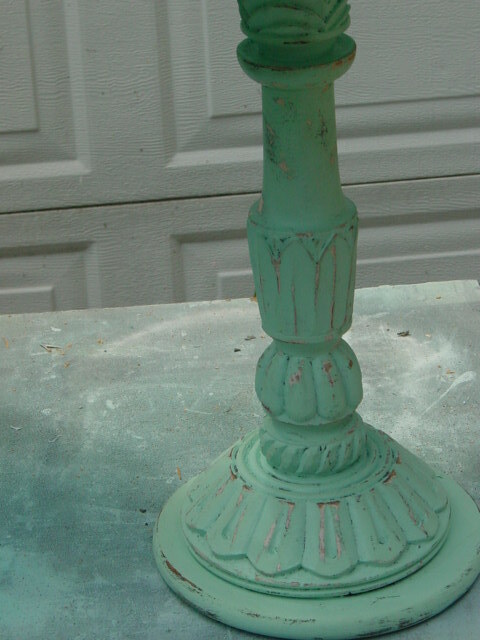 Painted the whole thing black first, then the aqua, then sanded to distress. 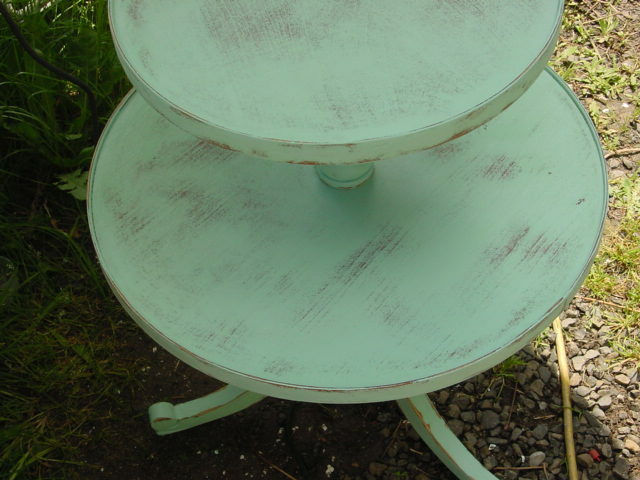 This vintage two tier drum table is a recent re-do. Was originally a beautiful mahogany wood that I restored with some oil finish because the wood was just too pretty to cover up. Alas, no one else seemed to like the original color (it’s gone without selling for over a year!) so it was time for a re-do! 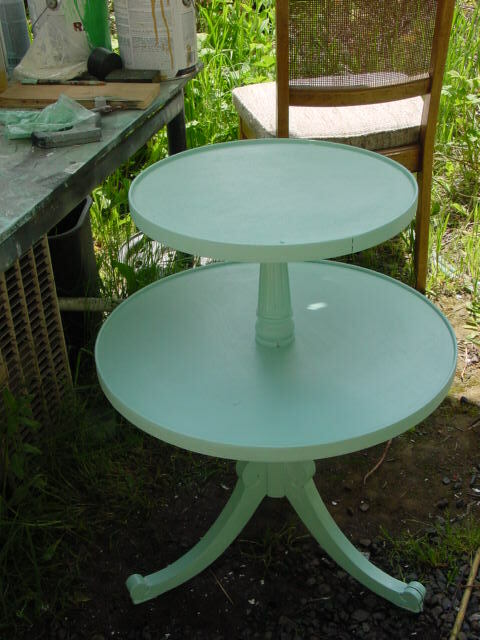 A couple of good coats of the aqua paint; then sanded to distress. That was the original color. 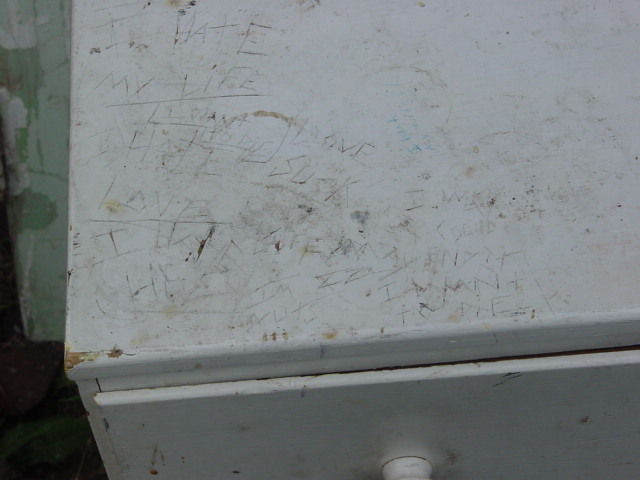 Oh well, so much for preserving the natural beauty of the wood, eh!?! Like I said, NO such thing. 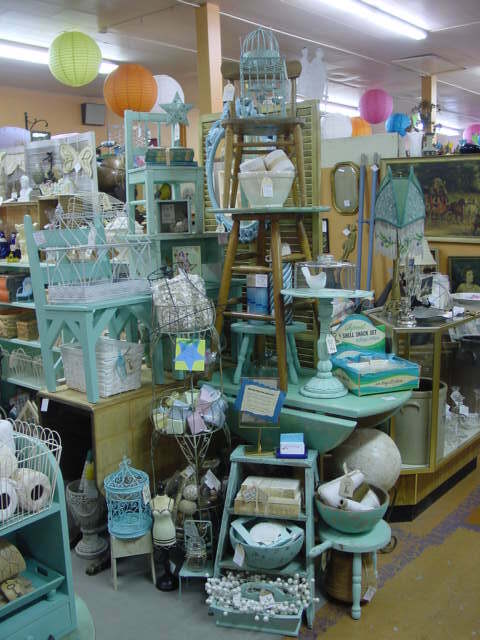 . . .
. . . as too much Robin’s egg blue! Distressed along the edges. 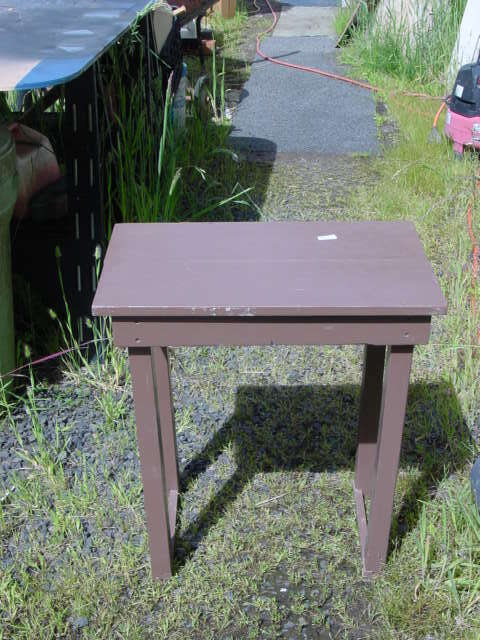 AND I just found another smaller ‘but very similar’ to this one table that I can ‘nest’ underneath it. They will be going to an upcoming trunk show. 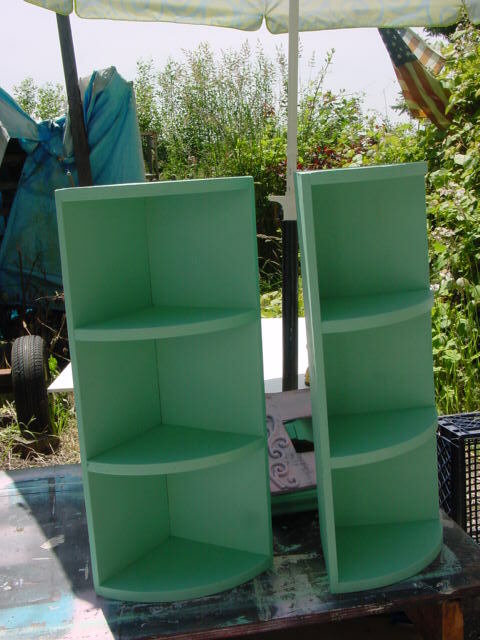 A couple of ‘quarter round’ shelves. Michael makes these from reclaimed wood. 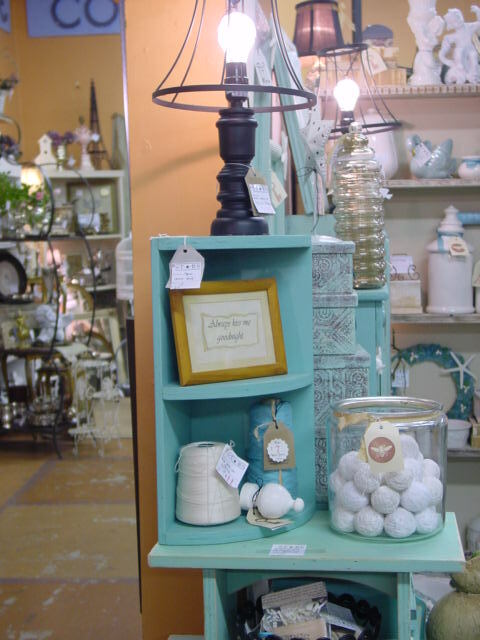 A little wall sconce shelf and a few frames. This is the biggest frame ‘before’. It looked better this way, which is actually upside down; because there was a ‘notched’ edge on the front. This is the ‘right way’. 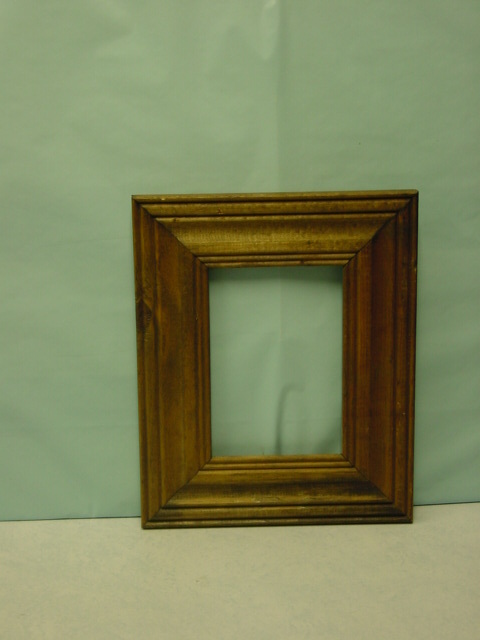 The picture would have set on the FRONT of the frame, instead of ‘back inside’ as with most frames. It just didn’t look quite right to me like this. 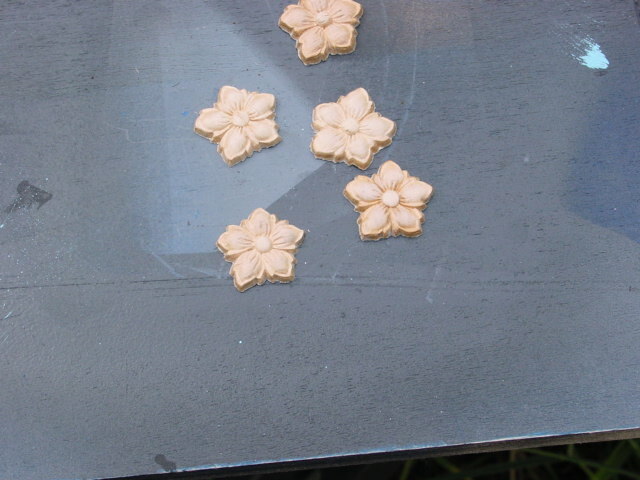 So I rummaged through my wood embellishments box and found these. Just enough to soften those hard edges.